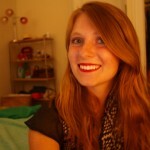 THE RED QUEEN | A Carolina Scientific Blog of thoughts on research in biology and psychology. 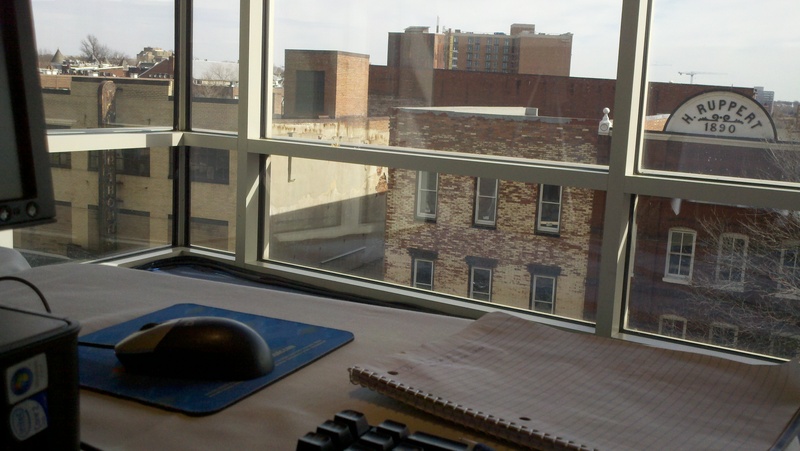 A Carolina Scientific Blog of thoughts on research in biology and psychology. I no longer update this blog (but leave it up anyway, as a nice reminder of where I started out), so if you’re looking for Rebecca Searles online, please visit my personal website, LinkedIn profile, or HuffPost author page. For more writing on evolutionary psychology and biology, visit my blog at Psychology Today. Every year, the National Association of Science Writers (NASW) sponsors a handful of talented student writers to attend the AAAS scientific conference with $1,000 travel fellowships. Any undergraduate interested in science journalism can apply, and this year the conference will be held in Vancouver, Canada (Feb. 16-20, 2012). The fellowship includes a mentoring program and your resulting news coverage to be published to the NASW website. Last February, I was lucky enough to be selected for the NASW fellowship in Washington, D.C., and it was one of the best career moves I made. 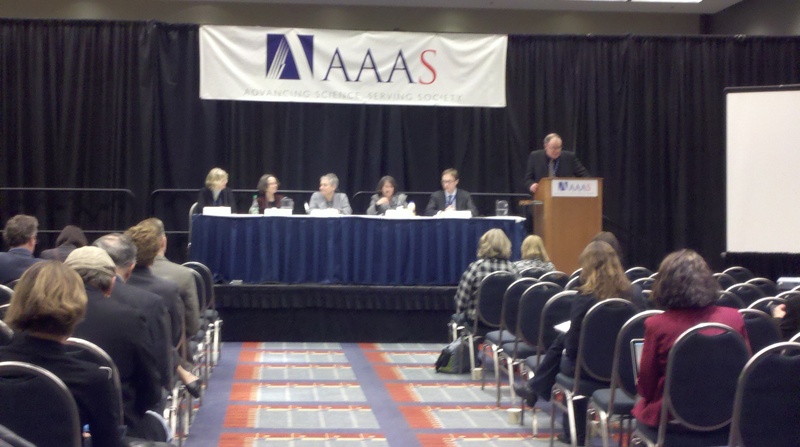 One of the AAAS presentation panels. The annual AAAS conference is arguably one of the largest and most important scientific conferences out there, and so it offers a great real-world experience (not to mention resume-booster) for the blooming writer or researcher, simply by being there and taking it all in. When I attended last year, I was kind of bowled over by all the brain power housed under that one roof. To think that I was walking among the biggest hotshots in science today—I had a little nerd-gasm. They gave me a press badge that granted me special access to security-guarded rooms swarming with hurried journalists from NPR, ScienceNews, NewScientist, NYTimes, Discover—every major media name (with a science section) you could think of. These were rooms even the scientists weren’t allowed into, much to the chagrin of some certain researchers who had to be manhandled by security to prevent their entry. And that is another thing you’ll experience at the AAAS: The significance of research article embargoes (time-sensitive bans on the release of information) and the high-stress environment of science journalism. As part of the fellowship, you are expected to cover an AAAS presentation of your choice. Your article turn around, including edits, occurs in less than 24 hrs—another real-world experience in life as a journalist; high-pressure deadlines are inevitable. The article is then published on the NASW website, and you can always refer to this clip for use with employers (the clip stays up forever). You can read my article from last year here. One of the biggest draws to the fellowship is the one-day mentoring program. NASW pairs up each fellow with a veteran in the field. They spend most of the day with you, answering all your industry questions, explaining the layout of the conference and how to tackle your NASW article, and most importantly, introducing you to all the biggest names in science publishing. My mentor remains active in pushing me towards my career goals, and is always a reliable expert resource for all my industry questions—from negotiating job salaries, to the reputations of various publishing companies, and all of the sticky, but important, details in between. The NASW also sponsors an internship fair at each AAAS conference that draws many of the best companies in science media. About 15 or so different representatives attended last year, and we were able to interview with such names as Nature, Science News, The Scientist, Discover, Scientific American, ACS, Argonne National Lab, etc. These companies attend every year because they know NASW draws the brightest young science writers, and they often find their future interns and employees here. If you are interested in attending a graduate program in science journalism or a related field, this fellowship may be really helpful for networking. Robert Irion, who co-directs the NASW travel fellowship program, is also the director of the Science Communication Program at UC Santa Cruz. In addition, you’ll be mingling with professors and directors at such graduate programs as MIT, Boston University, UW Madison, among others. In the evenings, science writers love to get down. No kidding. The NASW held a few parties and get-togethers over the four-day conference. One in particular that stands out in my memory (or doesn’t), was the $60,000 cocktail party with a full buffet at the Swedish Embassy. Bartenders dressed in white lab coats served blue test-tube shots rimmed with pop rocks called “particle colliders.” After everyone had gotten a few drinks in them, we shed our networking-mode niceties, and hit the dancefloor. The DJ played cross-generational tunes, and I found myself shaking it with a bunch of 40-something journalists who apparently still knew how to have a good time. I even made a good group of young science journalist friends at that conference, whom I still stay in touch with (which basically entails sharing job/internship opportunities and commiserating over the destitute next five years we will serve as starving young journalists in the field). Carolina Scientific writers, I encourage you to apply! Since you have presumably already published an article or two with us, you already have half of the fellowship application (the writing sample) on lockdown. Which is more than many other applicants will have, trust me. (Many colleges don’t have a good outlet for publishing science journalism, especially one as awesome as CS.) So hop to it! The deadline to apply is Dec. 1, 2011 (passport is needed). 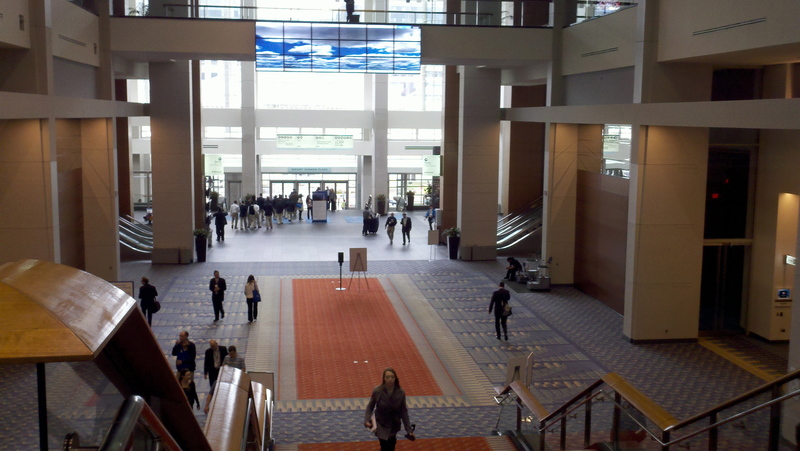 The enormous Walter E. Washington Convention Center where AAAS was held in D.C., 2011. The view from my press desk. 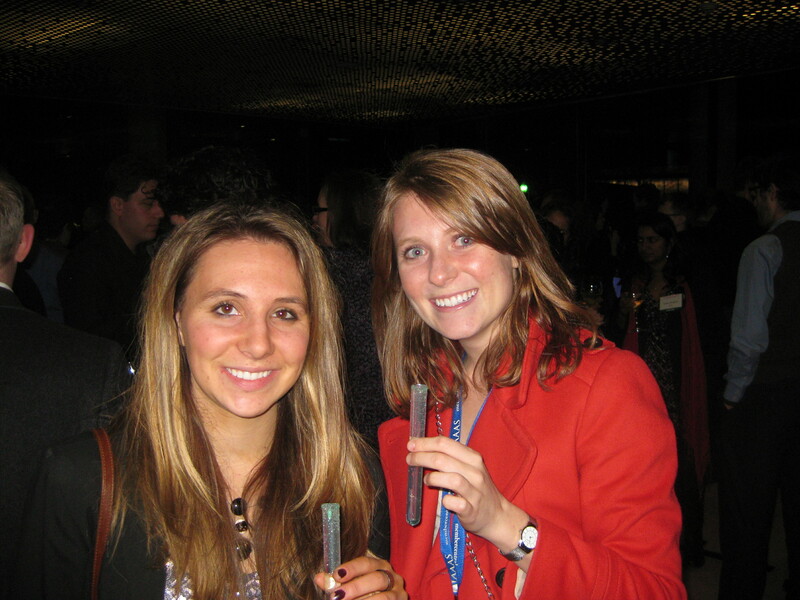 One of the other fellows and I with our "particle colliders." 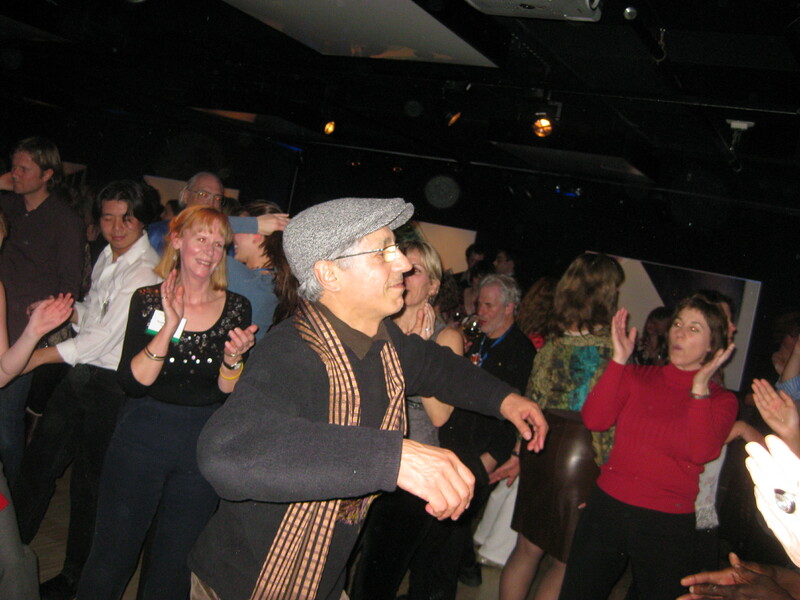 One of the science writers gettin' it on the dance floor at our NASW party at the Swedish Embassy. 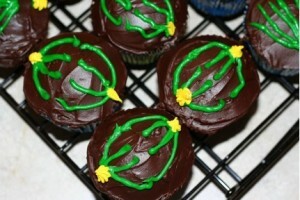 Fudgy chocolate sour cream cupcakes with mocha ganache, inspired by images from Kop's research. A science geek-foodie’s dream come true. In celebration of her most recent publication, “Mitotic Spindle Proteomics in Chinese Hamster Ovary Cells,” Dr. Ahna Skop of UW-Madison made these delicious-looking sour cream-based fudge cupcakes iced with mocha ganache. Dr. Skop, I admire your seamless integration of my two passions, and I will be baking up a batch of these for my friends pronto (but only the sciencey friends, because only they will fully appreciate them). For the full recipe, visit Dr. Skop’s blog. 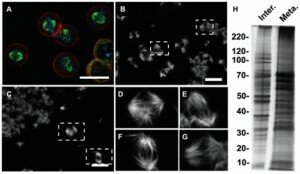 Images from Dr. Kop's latest research on mitotic spindles. Proper function of the mitotic spindles is essential for cell replication, and therefore propagation of any species. By identifying the proteins that make up the microtubules in this system, Dr. Skop and colleagues hope to create a clearer profile of the mitotic process, which has implications for newly-evolving cancer therapeutics. What a nice little throwback to Biol 205. 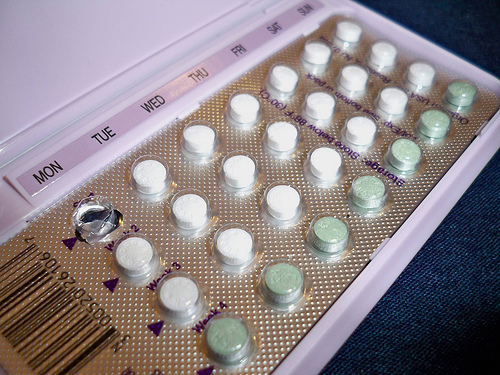 On Monday, the Wall Street Journal came out with an article on the Pill (oddly familiar to my PsychToday article, cough cough) on how hormonal contraceptives may be disrupting the sexual attraction chemo-signals we give and receive. The most recent research that pushed this ‘old’ news into the spotlight again was conducted by Duke University’s Primate Center with lemurs. They injected experimental subjects with depo-provera, a hormonal contraceptive, and measured their attractiveness, and their attraction to other lemurs. Their findings confirmed prior research findings, that contraceptives may cause humans and animals to seek mates who have more similar major histo-compatibility complexes (MHC). Naturally, we are designed to seek the opposite, in order to produce offspring with more varied MHC’s, and thus healthier immune systems. So, this could have implications on the health of the children produced from these hormonally-skewed relationships. And you can read my PT take on it here. What’s more is evolutionary psychology made headlines yet again this week in a New York Times article on success. The author makes a case for both happiness and anxiety to be evolved emotions, set in place to help humans adapt to the ups and downs of life. Turns out, humans overestimate the impact of certain life experiences like, say, winning the lottery or becoming paralyzed. Though we may expect to feel happiness or sadness for a long amount of time, most people “regress to the mean,” and feel similarly to how they did six months ago, before that huge promotion, or before the loss of a loved one. But if we were that realistic, and kept in mind that we would feel the same level of happiness no matter the outcome, maybe we wouldn’t strive so hard to achieve that big promotion or accomplish that daunting task. In that way, the anxiety and lack of happiness keeps us motivated to succeed and find that happiness again, however temporary. This comes primarily out of the behavioral economics aspect of psychology, (and has thus found its way into the Business section of the NYT) but it has evolutionary roots. Perhaps this is why we find that pessimists are more realistic, and our roseate, happy-go-lucky friends are rarely the most productive. You can read the NYT article here. This borders a similar field called positive psychology, in which the functions and health outcomes of positive emotions are studied. At UNC, Barabara Frederickson’s Positive Emotion and Psychophysiology Lab studies this in particular. Barb is really well known for her work in the field and her book, Positivity. I’ve worked under Dr. Sara Algoe in this lab for about a year and a half, and found that this is a really exciting, burgeoning field. And if you have an interest in evolutionary psychology, it is one of the best labs at UNC to get involved with. So, I wanted to take the opportunity to plug for them when I could. I think it’s great that the EvPsych field can pop up in Health news equally as much as it can in the Business section of the New York Times. It really seems to apply to almost all aspects of life, and that’s why I find it so fascinating. In an effort to appease the hungry beast that is UNC Student Congress, and get a little more funding, Carolina Scientific content has officially gone online. I’m really excited to see how our writers will show their creativity and express their research interests in this more-flexible writing forum, and I hope their enthusiasm for science will rub off a little on our readers as well. Should be an interesting endeavor! Rebecca Searles is a UNC Chapel Hill graduate of Biology and Psychology, and former Editor-in-Chief of Carolina Scientific.